I started running for one reason only. Well, maybe two: second helpings of tacos and/or that extra glass of wine. Sidelined by two slight but nagging injuries and five pounds gained, I made this Farro Stuffed Tomato on Arugula with Black Beans and Feta to help steer my food-loving face toward better choices. Bit players on the plate include walnuts and julienned cucumber and red onion- YUM! This is a hearty, filling, flavorful lunch salad yet still a lighter meal. You know, like, if you’ve been eating too many tacos of late. Farro Stuffed Tomato on Arugula with Black Brand and Feta- this was seriously holy freaking yum good. Cook farro according to package directions. I added salt, onion powder and garlic powder to my cooking water, and used the “put the grain in the pot, ad two or three cups of water, cook until tender, then drain off all the extra water” method. When farro is done (taste it… tender + done), drain off cooking water and while it is still in the pot, drizzle about one tablespoon of olive oil and half a tablespoon of balsamic vinegar over the grain. Mix in salt, pepper, and any herb blend at this point, too. Fill each tomato half with the seasoned farro mixture. Drizzle arugula with a little more salt, pepper, olive oil, and vinegar and dig in! 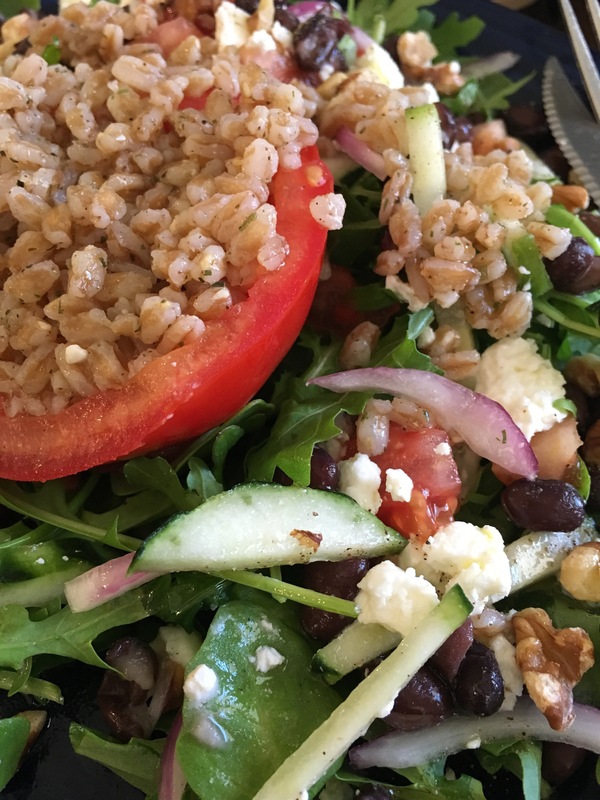 Have you tried farro yet? It is one of the ancient grains that have been appearing in the markets recently. Along with quinoa and chia, farro has been cultivated for centuries, if not millennia. How does it taste? Well, I think of the grain as a larger, more mild and more tender version of barley. It took a recipe this tasty to write up another blog post here on Branching Out on a Limb. I had intended to just snap a picture for my mom and tell her about my lunch creation, but the picture and recipe were too good not to share. This salad would also be great with beets, goat cheese, and pine nuts over romaine; turkey, dried cranberries, and hazelnuts over butter lettuce… please share your own great combinations!